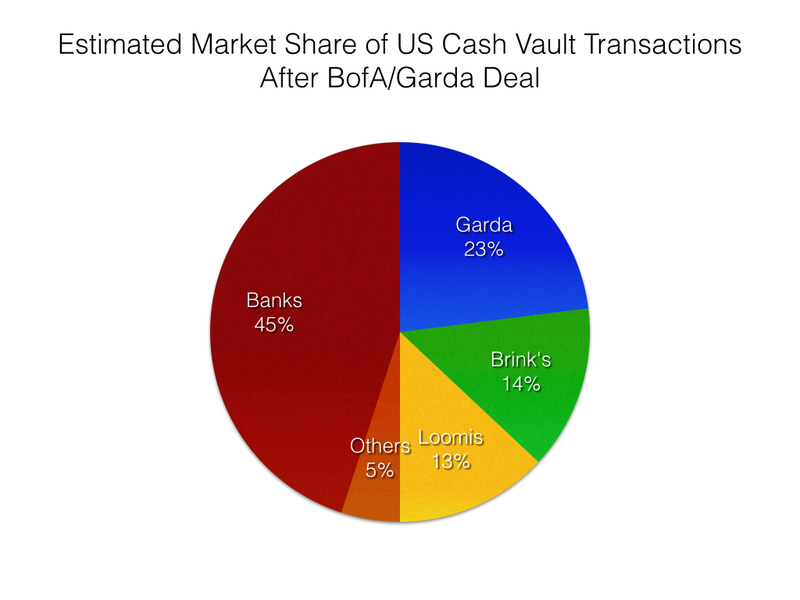 Is the BofA/Garda cash vault outsourcing deal a tipping point? Earlier this week Bank of America announced a huge agreement to outsource all of its remaining internal cash vaults in the US to Garda. The deal, reportedly worth $1.4B over 12 years, is undoubtedly the most significant in the history of the industry in the US. How does this deal change the market and what are the impacts going forward? Impact on US Market – The US market has lagged behind some other countries in outsourcing of cash vault processing. 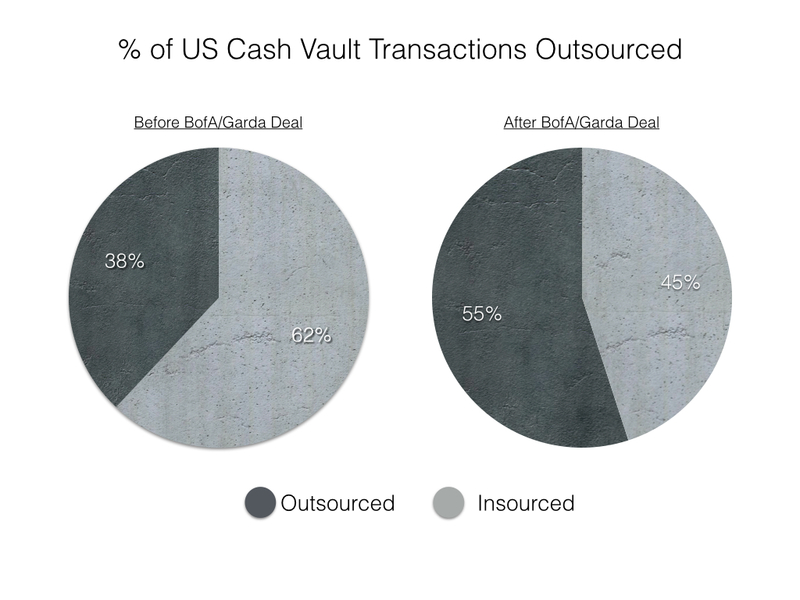 Prior to the BofA deal, only 38% of cash vault processing work was outsourced with 62% of the work still being performed by financial institutions. This agreement will push the outsourced share over half to roughly 55%. While all major banks in the US have outsourced some of their cash vaults, the majority have retained their larger vaults internally. This reluctance to outsource has been due to two primary factors; low/no perceived cost savings in outsourcing larger vaults and concerns about quality issues. 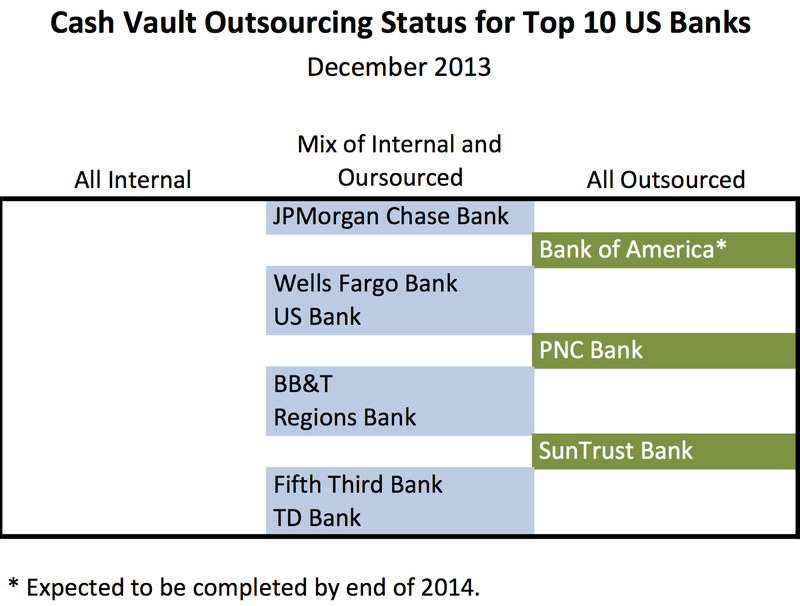 Bank of America will be the 3rd of the top 10 US cash processing banks to have committed to full outsourcing and the largest by far. This deal also propels Garda from 3rd place in the US market for cash processing into 1st by a fairly wide margin. While this deal is significant in and of itself, does it mark the beginning of a trend towards further outsourcing? There is no question that the execution of this outsourcing agreement will be watched very closely by the industry. By my calculations, the award will roughly triple Garda’s cash processing business. Executing this much new business across a wide geography (32 vaults) is very complex. While perfection is not expected in a project of this size, the armored car providers in the US have had major failures in the recent past that have negatively impacted bank’s customers. Garda recently reorganized their US operations to separate cash vault processing from armored transportation. They also hired ex-Brink’s US COO Shellie Crandall to run this line of business for them. They will also be taking on existing BofA employees, facilities and equipment to help in the transition. I think all of these moves put Garda in a better position to be successful. However, having been through full outsourcing deals myself in the past, I know they will have their hands full in trying to absorb the work. Side note – The organizational structure where cash vault processing is separated from armored transportation has been in place for all 3 of the major full outsourcing deals in the US. About 10 years ago, Brink’s had this structure when they won the PNC and SunTrust deals and now Garda has had the same structure in winning the BofA vaults. In the 8 or so years in between SunTrust and BofA nobody had this structure and no major banks committed to full outsourcing of their cash vaults. I do not think this is a coincidence. The armored car function (trucking) is very different from the cash vault function (bank transaction processing). Having a dedicated organization to support this helps to provide focus to the requirements of the business and to give customer’s comfort that you are serious. Armored carriers, however, see cost efficiencies (and an avoidance of political battles) to be gained from merging the two business. These typically prove too attractive to pass up given the quarterly results mentality that most of the industry is enslaved to. If Garda has significant and visible problems, this will make further major outsourcing deals with any provider in the industry very difficult. If they are successful, then what? Right now the other major banks in the US are taking a wait and see approach. Several of them are looking at this as an opportunity – if BofA does experience problems then I can leverage my internal vaults to pick up new business. As a result, I would not expect any other major changes in the short term (this is good for Garda as they will likely be very busy over the next couple of years.) However, with success, the change will put pressure on other banks to justify holding on to internal operations. As cash processing becomes less and less of a differentiator in the banking industry, it will likely lead to further outsourcing. However, the conservative approach of banks in the US remains and it will likely take 5-10 years before outsourcing would move above 80%. Would Garda be best positioned to win other business? If Garda is strategic in their approach, they can leverage the BofA volume to their advantage with other banks. However, banks will have some natural reluctance to have too much of the industry’s volume with one company (the Fed may also have concerns). As a result, I think this will take a broader vision than an “economies of scale approach.” Whether or not Garda will be able to do this remains to be seen, but right now I would say that all of the major players have a roughly equal opportunity. Given this, the armored carriers all have a vested interest in this deal and should be rooting for Garda to succeed. This entry was posted in Cash. Cash costs Americans $200 billion a year. Really? I’m surprised that BoA was okay with Garda making the announcement — usually they keep this kind of vendor stuff close to their vest. Serhan Atabaş on The Top 100 Smart Safe Manufacturers? Stefan on The Top 100 Smart Safe Manufacturers? Jessica Pohlen on The Top 100 Smart Safe Manufacturers? The Top 100 Smart Safe Manufacturers?